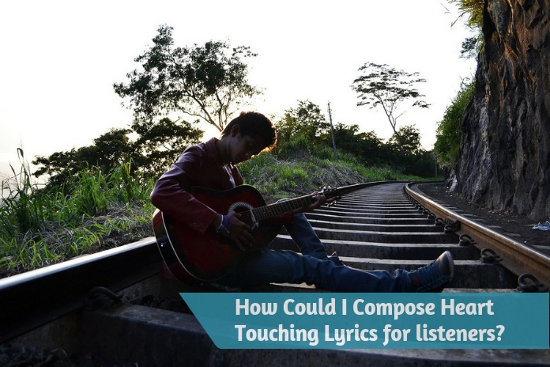 How Could I Compose Heart Touching Lyrics for listeners? - GoodGuysBlog.com - New, Technology, Marketing, Health and So on. Home / music / How Could I Compose Heart Touching Lyrics for listeners? Listening to songs is one of those activities which people enjoy in multiple different types of moods whether good or bad. However, the best songs that people find are the ones which touch their hearts and create an impact on them. Are you trying to write a song? Make sure it is heart touching and relatable for the listeners. If we look at the records, all the songs which have some sort of relatability and sentiments, gained popularity and got hit. Therefore, put in sentiments and feelings in your lyrics to create an effect on the listeners. To achieve that, follow the following process. By setting the stage, it simply means to identify the specific emotion that you want your listeners to feel while listening to the song. It is very important to identify the target first so that you know where you are headed. Once you are done identifying the lyrics, analyze the right words to use in the lyrics. Words play an important part in affecting a human’s mind and therefore, you must select the most appropriate ones. After the words, the tone must be identified and finalized according to the mood of the song so that you are able to deliver the words in the right frame. After the words and mood, set the rhythm in which you want your song to be in. rhythm is an important part of any song and it must be according to the genre that you have decided. Make sure to keep the rhythm as attractive and engaging as possible so that the listeners stay captivated and it touches their heart. The hook of the song is the part in any song which attracts the listener and keep them hooked to the song. The hook is also known as the chorus. The chorus of the song plays an important part in evoking emotions in the listeners and therefore, you must pay special attention to it. The chorus’ tone and mood should be also according to the emotion that you are targeted. For instance, if the mood of the song is love, then the chorus should be soft and melodious. As for the energetic songs, keep the chorus high pitched and fast so that the listeners get in the mood and stay hook to the song. Before starting to write, you must get in that feel as well. The emotion you are targeting through your song must be the emotion you are feeling at the time of writing down the lyrics. The lyrics come out to much more heart touching and better when the writer is feeling the emotion too and is in the stance of it. According to most of the experts at cheap essay writing service UK the best time to write a love song is when you are in love or heartbroken over your true love because that is the time when you will be able to feel the lyrics yourself and excellent content will be generated naturally. One of the most effective strategies to compose a heart touching lyrics is to add in a bit of real world situations and examples. When people are able to relate to the lyrics on a practical level, they are able to feel it much deeply and hence it creates an impact on them. Regardless of the mood of the song, you will be to find ample amount of real world examples and situations which could be added in the lyrics. Last but not the least, you cannot try to target completely different ages in one song. Make sure that you have your targeted age of audience in mind and the content you write is appropriate according to them. Similarly, the mood should be appropriate as well. You cannot target elderly people for an energetic dance song. Heart touching lyrics is an important part to make your song successful and to write that type of lyrics, discussed above are some of the points which would definitely help the song writers in this regard.